The 80 large (100 m²/ 1200sq.ft.) 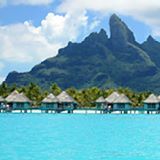 Intercontinental Thalasso overwater villas are poised above one of the most calm, turquoise areas of famous Bora Bora lagoon. 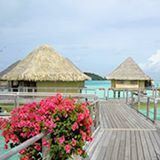 These magic hotel 'rooms' sit along 2 crab claw shaped pontoons stretching out from the white sand beach and many offer the best view of Mt Otemanu. 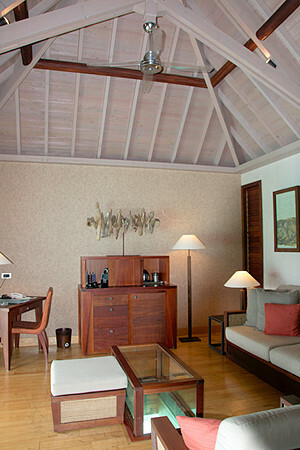 All of these stylish Intercontinental Thalasso overwater villas offer the same airy, spacious interior and deck. Your choice is about a villa's location on the pontoon and the outlook you will enjoy. 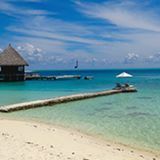 This area of the lagoon is usually calm and has a soft, white sand bottom (creating the intense blue water color) so it's perfect for swimming. 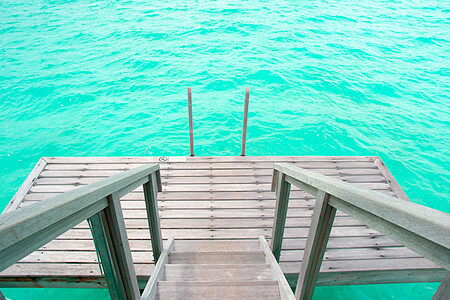 If you want to jump from your deck, choose one in deeper water. 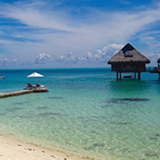 The Intercontinental Thalasso overwater villas reflect the traditional Polynesian 'fare' but offer all the amenities of a first class hotel room, including 2 flat screen televisions. Walking into the elegant simplicity of the contemporary interior is a wonderful surprise. Polished wooden floors. High, washed-wood ceilings. Textured 'white-coral-look' walls. Creative, modern artworks. Classy, wooden furniture, upholstered and cushioned in white. 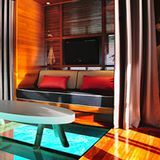 Each room has a wall of floor-to-ceiling glass, showcasing the blue lagoon. With the options of transparent curtain for day-screening and block-out for night time. The luxurious bathroom has black slate floor, double sinks and a huge, walk-in shower. A bath tub, big enough for two (imagine the intimacy!) overlooks the lagoon. In the bedroom, the comfortable bed faces the lagoon. There's a huge walk-in closet. The living room has a dining table with a view, and a relaxing sitting area with a glass coffee table to see the lagoon below. The glass doors from the living room open wide to a deck partly shaded by a thatched pergola. A dining area is made private by a creative screen of natural wood. 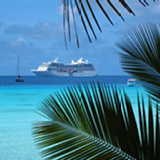 You can soak up the sun on stylish lounges. And when you get too hot, it's a few steps down to your own pontoon where you can slip into the lagoon and take a fresh water shower after your water play. 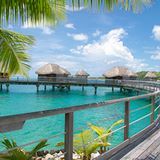 19 Intercontinental Bora Bora Emerald Overwater Villas are set on the resort side of the pontoon with views towards Motu Piti Aau (meaning 'two hearts' in Tahitian). 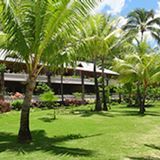 Your aspect is across the turquoise water to a white sand beach fringed by palms and the resort's romantic Polynesian style main buildings. Three are equipped with disability access. 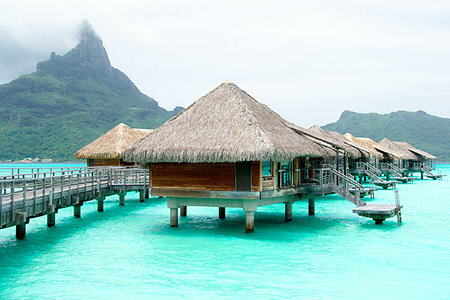 22 Intercontinental Bora Bora Sapphire Overwater Villas have tranquil views of Bora Bora lagoon's iridescent blues. 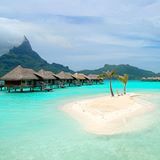 8 Intercontinental Bora Bora Otemanu Diamond Overwater Villas are at the end of the jetty, poised over lagoon that is at least 1.8 meters deep. These have the most privacy and magical views of Mt Otemanu. 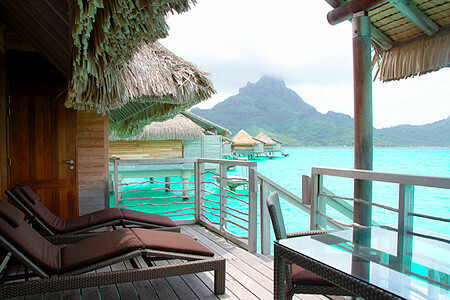 6 Intercontinental Bora Bora Otemanu Diamond Overwater Villas have splendid views of Mt Otemanu and the lagoon. 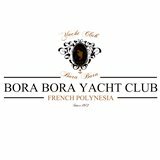 25 Intercontinental Bora Bora Otemanu Diamond Overwater Villas have a Bora Bora Island and lagoon aspect. 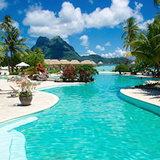 Is the Intercontinental Thalasso Bora Bora for you?